Bananas are pretty popular in our house. It's the one fruit that every family member seems to love. There are so many ways to enjoy bananas, but here are just a few of my families favorites. Bananas are the perfect portable treat so just eating them plain is at the top of our list. We also love banana's in homemade banana pudding, smoothies, shakes, pancakes, salads and baked goods. By far quick breads and pies are my favorite, but when the bananas start to get over ripe I like to make Banana Bread and Chocolate Chip Banana Muffins. Those seem to be my family's favorite sweet treats. Besides breads and pies I also love to bake cakes, so today I want to share an easy recipe for a Banana Cream Poke Cake. 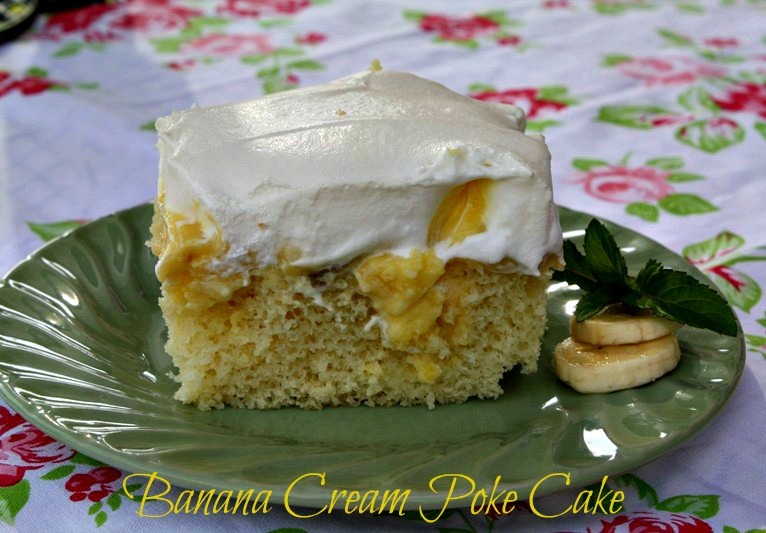 Y'all know I love my sweets so when Walmart asked me to share a recipe using bananas I didn't waste anytime coming up with this yummy poke cake recipe. I love the vintage jell-o and pudding poke cakes, so for me bananas, pudding and cool whip just sounded like the perfect combination. I have to say this banana cake turned out really good. I actually think it taste better the second day after the flavors settle in. If you love pudding poke cakes you need to try this version. I purchased everything I needed at my local Walmart: 1 - 8 oz cool whip, 2 - bananas, sliced, 1 - 18.5 oz yellow or golden vanilla cake mix, 2 - boxes of instant vanilla pudding. (I think one would be enough because I had plenty pudding left over). Bake the cake according to package directions for a 13x9 inch pan. Let the cake cool for 15 minutes, then poke holes in the cake with the handle of a wooden spoon. Try to space the holes a little less than 1 inch apart and make sure they're pretty deep. Combine one box of pudding mix and 2 cups of milk in a large mixing bowl (preferably one with a spout) Using a whisk beat the pudding just until smooth - -about a minute. Pudding should still be thin and runny. Carefully pour the pudding into the holes. Do this slowly until holes are completely filled, but pudding is not flowing all over the top of the cake. Put the cake in the refrigerator and chill for about an hour. Remove cake from fridge. Slice the bananas and lay them on top of the pudding layer. Frost with cool whip and return to the refrigerator and let the chill until ready to serve. Bake the cake according to package directions for a 13x9 inch pan. Let the cake cool for 15 minutes, then poke holes in the cake with the handle of a wooden spoon. Space the holes less than 1 inch apart and make sure they're pretty deep.Combine one box of pudding mix and 2 cups of milk in a large mixing bowl (preferably one with a spout). Using a whisk beat the pudding just until smooth - -about a minute. Pudding should still be thin and runny. Carefully pour the pudding into the holes. Do this slowly until holes are completely filled, but pudding is not flowing all over the top of the cake. Put the cake in the refrigerator and chill for about an hour. Remove cake from fridge. Slice the bananas and lay them on top of the pudding layer. Frost with cool whip and return to the refrigerator and let the chill until ready to serve. If you're looking for more banana recipes, I have included a few of our favorites. Southern Banana Pudding, Chocolate Chip Banana Muffins, Blueberry Banana Cheese Pie and Chocolate Covered Banana Pops. We love smoothies, so here are some yummy smoothie recipes. Strawberry Banana Smoothie, Green Monster Smoothie, Blueberry Banana Smoothie and Bananarita Smoothie. Also did you know that you can freeze bananas? Well you can click here for my step by step tutorial on how to freeze bananas. Just thaw and use in smoothies, muffins, bread and baked goods. Don't throw over ripe bananas in the trash freeze them instead. I'm part of the Walmart Moms Program. Follow me and my other fellow Walmart Moms and our ideas. Walmart has provided me with a gift card and compensation for my time and efforts in creating this post. Participation in this program is voluntary and the opinions stated above are entirely my own. What a great recipe Tina! We love bananas too and I'm going to check out some of your smoothie recipes as well. Thanks so much for sharing your special recipes with us. This looks so good. But unfortunately my girls don't like bananas. Made this and loved it! I only put bananas and cool whip on half at a time, because I don't like mushy bananas. Also, the cake had more flavor the next day. Thanks for the recipe! Lovely recipe using bananas. My 10 year old is going to love this. Bookmarked. Thanks for this great recipes using banana. It looks so delicious. We are planting banana that's why we are always have a lot of it. Now I have new recipes to do this weekend. I made this last night and all the kids loved it! The only change I made was I used Banana Cream pudding instead of vanilla ( it's what I had on hand) I'm thinking this recipe would be good using white cake, cheesecake pudding and strawberries. I might have to experiment a bit. Thanks for the great ideas!! I used banana pudding, too, and I also mixed up a mashed banana in the cake mix. It had good, strong banana flavor, but it wasn't overwhelming. I agree that it's even better on the 2nd day!! Thanks for this!! Made a half recipe for a small get together last night. Too bad. Nothing left over for the next day. Loved that this was not only yummy, but easy enough the grandkids could assist. Just made this cake and it was delicious!!! The only thing different I did was in the directions on the cake box...it called for 1 cup of water. I used 3/4 cup of banana liqueur than topped off with water to 1 cup. The alcohol cooks out and left a wonderful banana flavor. I made this cake using a butter cake and added both a banana and a dry pudding mix in the batter. Made them half into cupcakes. Waiting for cake to chill. Can't wait to taste. Thanks. For those wanting to try this but don't care for banana's, try using coconut cream pudding. I used the kind you cook and filled the holes while pudding was still warm. I liked it a lot.